According to the International Air Transport Association (IATA) each piece of lost luggage costs between $90 and $100 in direct costs to airlines and airports. 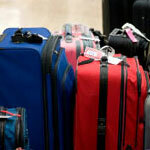 In an effort to eliminate these costs, ODIN technologies has developed a scientific RFID study for airline baggage tracking, named the RFID Baggage Tag Benchmark. The test results incorporated tag sensitivity and power effectiveness and concluded that RFID tags were 99.9% versus the conventional bar code at less than 90%, when used for tracking airline baggage on the high speed conveyors commonly used for returning luggage to their owners. A dozen airports worldwide are already using RFID tags for baggage tracking and it is expected to increase within the next five years.